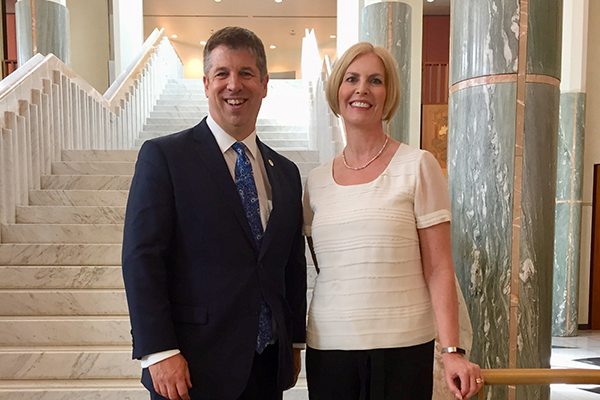 Caption: Jonathan Smithers, Chief Executive Officer, Law Council of Australia and Christina Blacklaws, President, Law Society of England and Wales. The Law Council of Australia in conjunction with Dr Helen Watchirs, ACT President and Human Rights Commissioner, was this week honoured to host Christina Blacklaws, President of the Law Society of England and Wales. The open forum event provided an opportunity to compare local, national and international perspectives on women in the law and the role of human rights frameworks in supporting equality and diversity. Representatives from the ACT Law Society, ACT Bar Association, Blumer’s Lawyers, Director of Public Prosecutions and Clayton Utz attended the event. Each organisation provided an update on recent highlights, current issues, initiatives and areas of focus on women in the law. It also dealt with ways to encourage more women into the profession and retain talent. While in Canberra, Ms Blacklaws attended other meetings held with the Law Council including at the British High Commission, with topics such as proposed changes to the England and Wales Solicitors qualification examinations and ease of cross border practice also coordination of international issues; regulation of the legal profession; and the UK’s interest in rule of law and small island states. The visit also provided a timely opportunity for the Law Council to seek an update on potential legal ramifications of Brexit and continue its strong relationship with the Law Society of England Wales.